Hutch Plus, Wichita Plus, & Buy Local Plus are the best ways to find & discover great local businesses. Printed Magazines: delivered via U.S. Post Office (not an insert) and includes both residents & businesses to all surrounding areas. That’s a total of 446,000 impressions a year! Free copies are available at most advertisers locations. Our Mission Is Simple: Make Finding Local Businesses Easier. 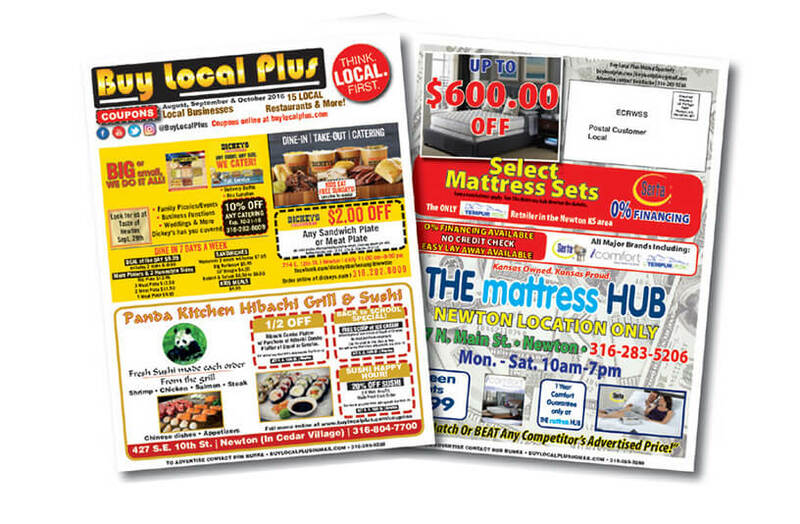 Whether targeting existing or acquring new customers, Print & Direct Mail plays an important role in generating walk in, phone, website traffic, & Social Media traffic. Operated by a team of dedicated marketing professionals, we get your name in front of qualified prospects in both print and internet, giving your business online exposure and advertising, while also encouraging both local residents and visitors from outside of the area to visit and patronize your establishment. Even New Movers? Yes! We deliver to every mailbox in the area including businesses, so New Movers are included. Buy Local Plus (Newton/Harvey County) – contact Bob Burke | 316-285-9288 | buylocalplus@gmail.com Click here to show phone / emails. Hutch Plus – contact Bob Burke | 316-285-9288 | hutchplussales@gmail.com Click here to show phone / emails. Wichita Plus – contact Michael Phillips | 316-209-5455 | wichitaplus@gmail.com Click here to show phone / emails.